The bill currently awaits Governor Baker’s signature. However, in anticipation of the bill being signed, employers should work with counsel to ensure compliance with all aspects of the new legislation. 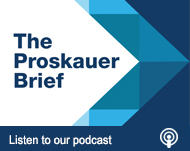 Proskauer will continue to provide updates regarding the status of the legislation and to help Massachusetts employers prepare if (or more likely, when) the bill becomes law.